Accustomed as we are to artists who make original color lithographs, it was not until the mid to late 1940s that original color artist's lithographs became common (before that time, both pochoirs and hand-colored etchings were the means by which artists presented works in more than one impression to their audiences). Picasso's first original color lithograph dates from October, 1945; Chagall's first original color lithograph dates from 1950; Miró made two in 1937 and 1938 (the later involving pochoir or the use of a stencil to paint the color directly on each impression), but did not begin producing original color lithographs regularly until 1947. Up until that the time, the artist would make a black and white lithograph, hand-color a model, and masterprinters would make the color stones for each different color involved. 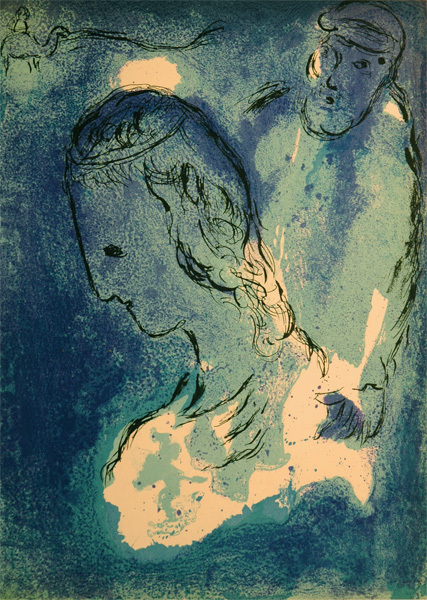 For Chagall, who was sent to Mourlot Workshops in Paris to learn how to make all of his stones himself by Aime Maeght, a lithographer before he opened Galerie Maeght in Paris in 1946, two sets of lithographs seem to have been crucial in making color lithography a regular part of his artistic activities, his 1952-1954 lithographs on Paris and his 1956 and 1960 sets of lithographs for Verve on the theme of the Bible. In these sets, everything seems to have come together for Chagall in a triumph of craftsmanship that enabled him to produce some incredibly rich works on secular and sacred themes. 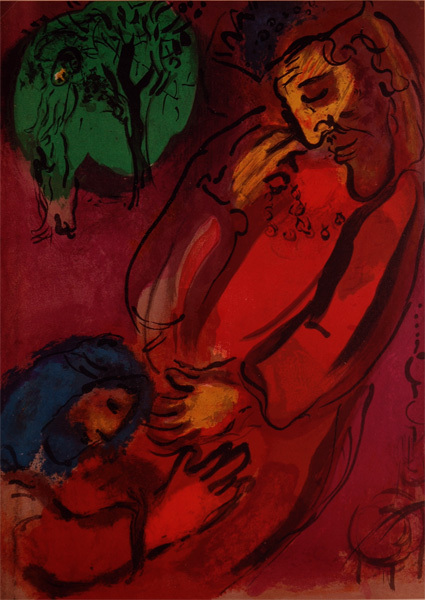 Marc Chagall (Russia 1887-1985 Paris), Abraham and Sara (M. 122). 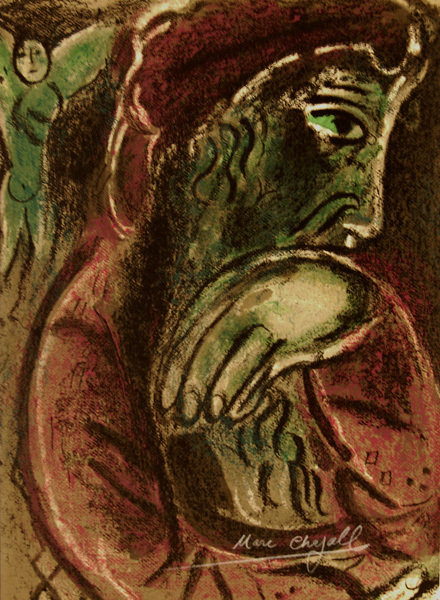 Original color lithograph, 1956. 75 signed and numbered impressions plus 6500 unsigned impressions as ours. 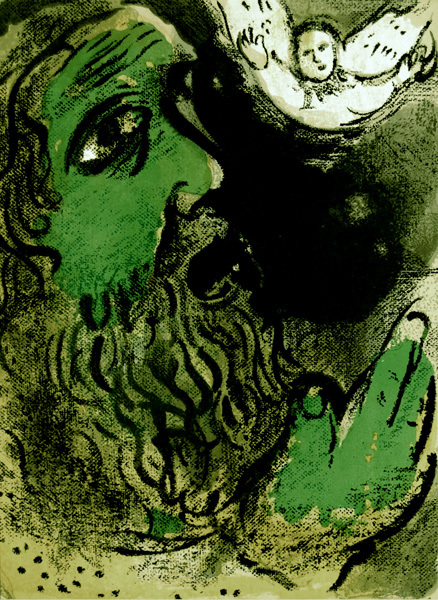 Illustrated in the catalogue for the 1973 Musee National Message Biblique Marc Chagall inauguration. Image size: 355x260mm. Price: $1750. 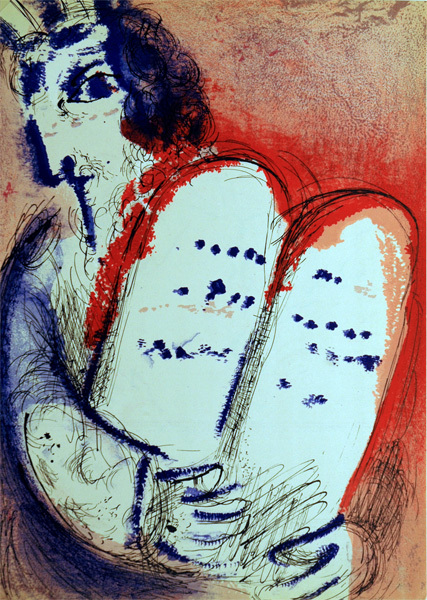 Marc Chagall (Russia 1887-1985 Paris), Moses with the tablets of the Law (M. 126). Original color lithograph, 1956. 75 signed and numbered impressions plus 6500 unsigned impressions as ours. Illustrated in the catalogue for the 1973 Musee National Message Biblique Marc Chagall inauguration. Image size: 355x260mm. Price: $1,875. Marc Chagall (Russia 1887-1985 Paris), David with his harp (M. 133). Original color lithograph, 1956. 75 signed and numbered impressions plus 6500 unsigned impressions as ours. Illustrated in the catalogue for the 1973 Musee National Message Biblique Marc Chagall inauguration. Image size: 355x260mm. Price: $2850. Marc Chagall (Russia 1887-1985 Paris), David Mourning Absalom (M. 134). Original color lithograph, 1956. 75 signed and numbered impressions plus 6500 unsigned impressions as ours. 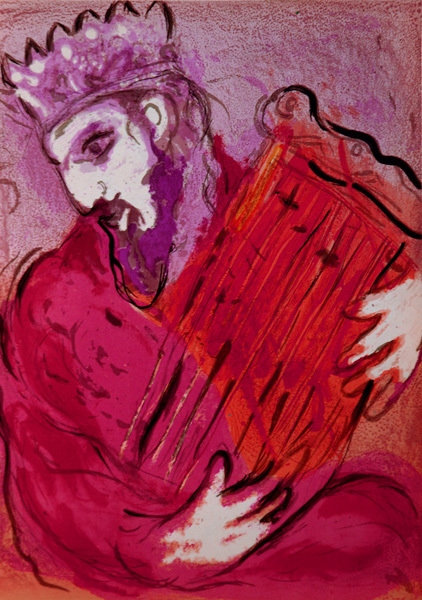 Illustrated in the catalogue for the 1973 Musee National Message Biblique Marc Chagall inauguration. Image size: 355x260mm. Price: $2850. Marc Chagall (Russia 1887-1985 Paris), Jeremiah (M. 139). Original color lithograph, 1956. 75 signed and numbered impressions plus 6500 unsigned impressions as ours. Illustrated in the catalogue for the 1973 Musee National Message Biblique Marc Chagall inauguration. Image size: 355x260mm. Price: $1,975. 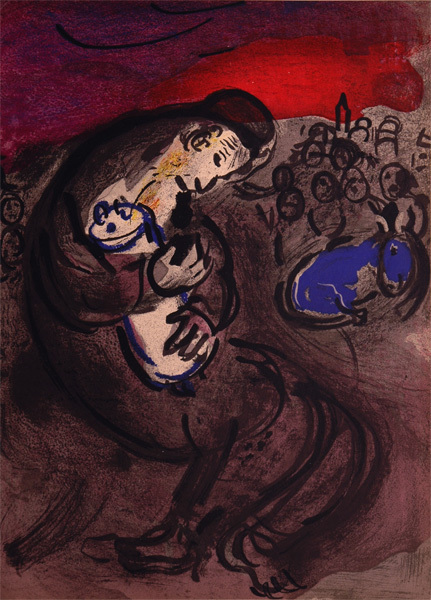 Marc Chagall (Russia 1887-1985 Paris), Jeremiah's Lamentations (M. 140). Original color lithograph, 1956. 75 signed and numbered impressions plus 6500 unsigned impressions as ours. 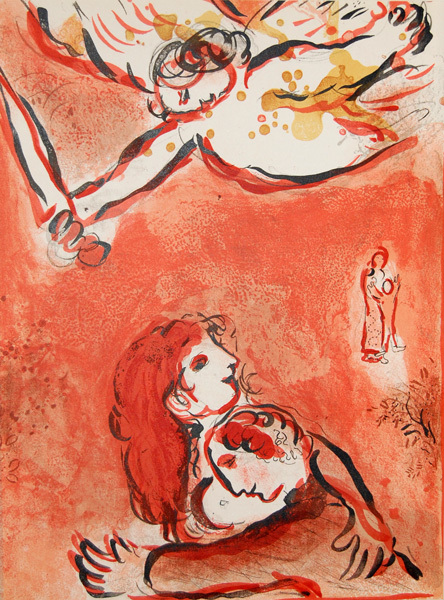 Illustrated in the catalogue for the 1973 Musee National Message Biblique Marc Chagall inauguration. Image size: 355x260mm. Price: $1,975. Marc Chagall (Russia 1887-1985 Paris), The Face of Israel (M. 231). Original color lithograph, 1960. 50 signed and numbered impressions plus 6500 unsigned impressions for Verve (of which ours is one). Image size: 356x253mm. Price: $1800. 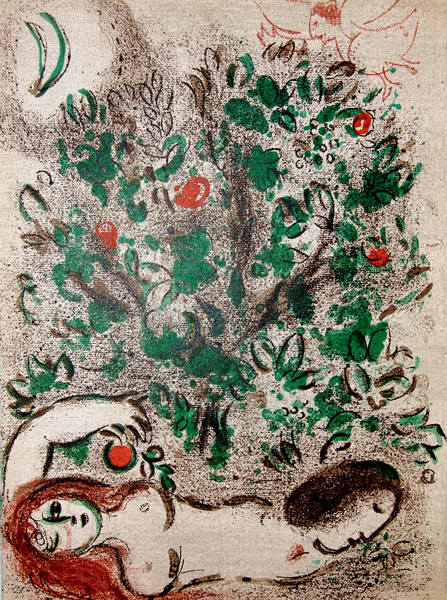 Marc Chagall (Russia 1887-1985 Paris), Paradise (M. 232). Original color lithograph, 1960. 50 signed and numbered impressions plus 6500 unsigned impressions for Verve (of which ours is one). Early commentators suggested that before the Fall, Adam and Eve were truly one flesh, separate but joined. Image size: 356x253mm. Price: $1800. 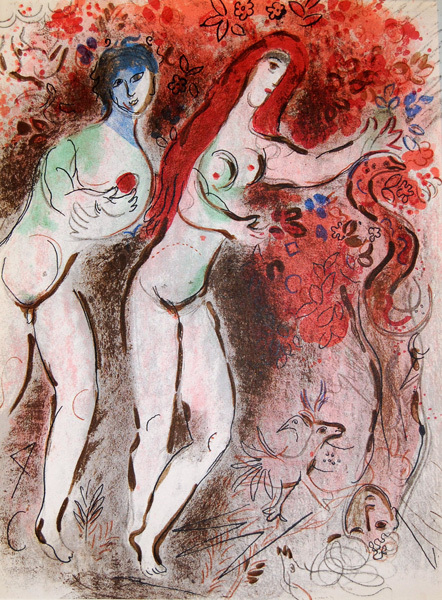 Marc Chagall (Russia 1887-1985 Paris), Paradise (M. 233). Original color lithograph, 1960. 50 signed and numbered impressions plus 6500 unsigned impressions for Verve (of which ours is one). The most sought-after lithograph in the 1960 Bible! Image size: 356x253mm. Price: $2250. 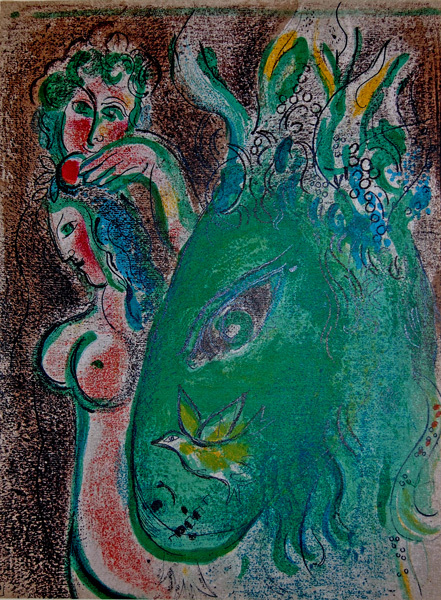 Marc Chagall (Russia 1887-1985 Paris), Paradise (M. 235). Original color lithograph, 1960. 50 signed and numbered impressions plus 6500 unsigned impressions for Verve(of which ours is one). Image size: 356x253mm. Price: $1800. Marc Chagall (Russia 1887-1985 Paris), Job Praying (M. 253). 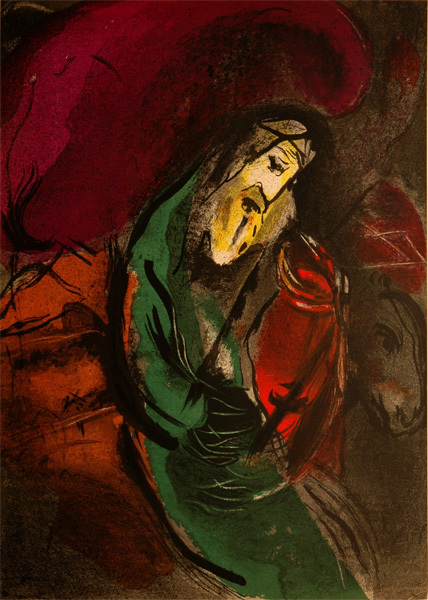 Original color lithograph, 1960. 50signed and numbered impressions plus 6500 unsigned impressions for Verve(of which ours is one). Image size: 356x253mm. Price: $1800.